(Press release) -Have some fun and benefit children in foster care at the same time! 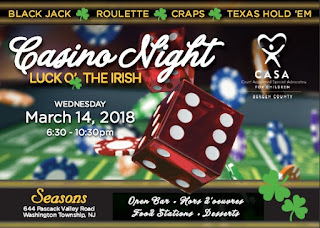 CASA (Court Appointed Special Advocates) for Children of Bergen County is holding its 14th Annual Event: Casino Night: Luck O' The Irish on March 14, 2018 from 6:30pm - 10:30pm at Seasons, 644 Pascack Road in Washington Township, NJ. Tickets are $135. Included in the ticket price is a wide array of hors d’oeuvres, food stations and desserts, open bar and $100 in casino play money. There will also be a basket raffle, silent auction with mobile bidding and other games in addition to exciting casino-style play throughout the evening. To purchase a ticket, please visit the website, www.BergenCASA.org or call 201-336-7520 for tickets and information. Donations for the evening's auctions and raffles are always welcome. If interested in donating an item or service, please contact Leslie Konikow at skikonikow@aol.com or call the office. 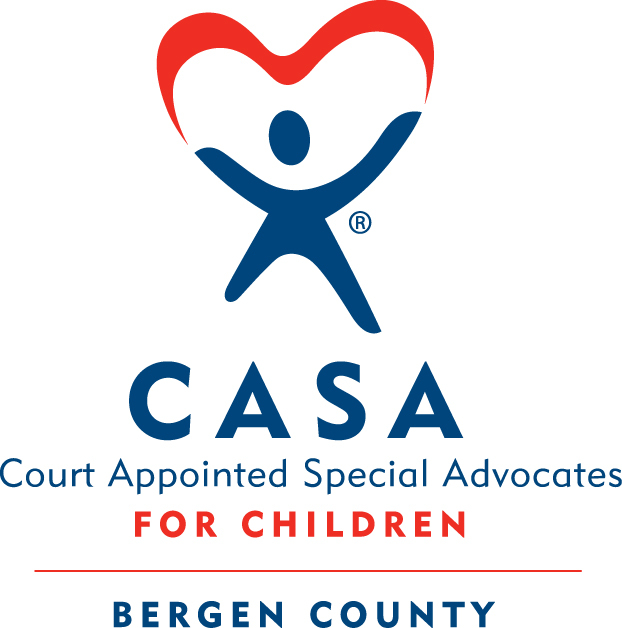 "At this year’s event, CASA for Children of Bergen County is honored to present our Annual Angel Awards to Charlene Barbetta and April Wuesthoff. Both Charlene and April have been on our Board of Trustees and made a unique significant impact to the growth and success of our program here in Bergen. We are a small non-profit and realize the tremendous difference a person can make. Charlene and April deserve this recognition," states Suzanne Ordas Curry, President. She adds, "We are an organization based on volunteer advocates. At this event we will also be recognizing the outstanding work of our advocates." CASA advocates are volunteers that advocate on behalf of the county’s abused and neglected children and work to ensure that needed services and assistance are made available to these children while helping them move toward safe and permanent homes as quickly as possible. CASA volunteers are assigned to only one case; either one child or one family of children at a time, which allows them to devote an enormous amount of time to that child so that he/she does not slip through the cracks of the judicial and child welfare systems. In short, the CASA volunteer is an open-minded and unbiased voice for the child in the court process and a consistent and caring person in the child’s life. Currently, there are more children in foster care in Bergen County than CASA has the volunteers or financial resources, to handle, and Bergen County CASA's goal is to have an advocate for every child. Advocates are always needed and additional funds help us grow the program. If interested in becoming a CASA volunteer, please visit the website and sign up for an information session. Current major sponsors to date include: TD Bank, Fidelis Group, The Lorin Konner Sherman Fund, Suzanne and Robert Curry, New Jersey Life & Casualty, Investor's Bank, Let's Pretend Toys, Maxine Horvath, Paul Ramsperger, Beckerman PR, Henry Senger, Robert and April Wuesthoff, The Timepiece Collection, LTD, and Senator Bob Gordon and Gail Gordon. For more information on CASA, email info@bergencasa.org or visit www.bergencasa.org. If you would like to make a monetary donation, would like to know how to become a CASA volunteer or would like to know other ways to help, please call Ellen Davis, Executive Director at 201-336-7520 or visit our website. 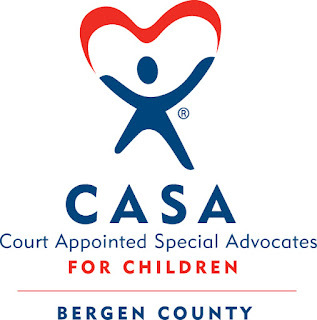 CASA is located at One Bergen County Plaza in Hackensack.